From August 13 at 9:00AM PDT to September 3 at 10:00AM PDT, Captains between levels 50-60 can queue up for our 10-captain “Crystalline Cataclysm” event to defeat the Crystalline Entity and earn one Crystal Shard every 20 hours. After collecting 14 of them, players can complete a new Event Reputation project to be rewarded with 50,000 Dilithium Ore, 500 Fleet Marks, 250 Marks of their choice (Fleet, Omega, Romulan, Nukara, Dyson, Undine, Delta or Iconian Marks). LC – Yes, yes YES! They didn’t change the rewards! I have a few extra shards laying around somewhere. o.O? The damage seems a tad high, but who doesn’t want the ability to have a few photon torpedo warheads on a ground mission. What could possibly go wrong? BONUS! Once the new, main reputation project is complete, a brand-new bonus 1-Shard project will become available to slot. 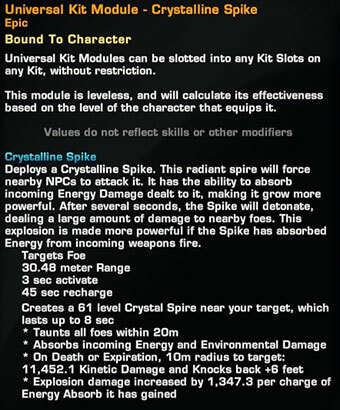 Completing this will earn players 2,000 Dilithium Ore, 50 Fleet Marks and 35 Marks of their choice (Fleet, Omega, Romulan, Nukara, Dyson, Undine, Delta or Iconian Marks). To participate and earn Crystal Shards, queue up for either the Normal or Advanced version of the event – a successful completion of either will award you with one Shard, in addition to the normal rewards. Lastly, stay on alert, Captains! Recent intelligence reports reveal that there are a few new tactics the Entity and its allies are using during this event to thwart your attempts of destroying them. Gather your friends for this epic event and we’ll see you in-game! With Season 11: New Dawn coming, we’re celebrating with free C-Store giveaways this week! We’ll be featuring something different each day leading up to the weekend, so be sure to check in and grab your free gift! Today our Free C-Store item is our “Section 31” costume pack! This will only be around from now until August 13th at 10AM PDT so act fast! 1. Log into the game on a Federation character between August 12th at 9AM and August 13th at 10AM PDT. NOTE: Claiming this option unlocks these costumes for all Federation characters on an account. Be sure to grab your costume pack and stay tuned for the next reward! This daily promotion is a decent bonus for new and returning players who’ve missed this in the past. For the lifers, chances are we’ve seen this a few times and wonder, what new plaything will they offer me today? (Really, really obscure dialog reference).